Let’s say your house is made of cinderblock, so why should you worry about termites? It’s not that simple, unfortunately. If termites just fed on wood or wood products then termites would not be as big of an issue as they are. All one would have to do is build a building out of materials that termites wouldn’t want to eat. Termites don’t confine their diet to just wood however; they also can eat plastics, paint, and fabric. Sometimes, termites might not eat non-wood products like these, but they will also sometimes use them to build nests. The result of termite infestation is ultimately damage to wooden structures. Because of their diet, namely wood and wood products like cellulose, many termite species damage buildings that are unprotected, as well damage or even destroy other wooden structures. In addition, as they can also often remain concealed and eat wood from the inside, their presence is often not detected until its too late. It is a far better idea to get on the phone to a termite exterminator in Scottsdale and have a termite inspection done to stop the problem before it gets worse. It has been said that there are only two types of houses in the Phoenix area, those that have termite problems and those that will. But is it inevitable that your property will be damaged by termites or that you’ll need to call for termite control in Scottsdale? It’s Not If You’ll Need Scottsdale Termite Control, It’s When! Every single day homes in Scottsdale are being silently attacked by insidious little wood eating creatures called termites. Before human settlements arrived in the Phoenix valley and Scottsdale, thousands of termites survived on the Desert floor. Termites flourish when provided with a source of moisture, shelter from the hot desert sun and an endless supply of fresh food … your home! With the influx of the human population, termite infestations in Scottsdale are all to common. With over 100,000 households in Scottsdale alone, termites have a limitless supply of fresh food for years to come. Are Annual Termite Control Inspections Needed In Scottsdale? A major calamity can be avoided by getting an AZ termite inspection done by a termite control company in Scottsdale. A lot of people are blissfully unaware of the problems that termites pose, termites are a big problem, to the tune of five billion dollars a year.. Their sheer numbers, well into the millions per nest, plus their diet is what can cause concern among property owners. 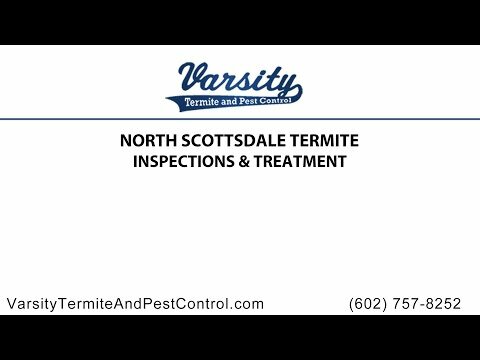 Does Varsity Termite and Pest Control Treat Different Species of Termites in Scottsdale? Yes! There are thousands of species of termites, and only a small percentage of them are considered pests as such and warrant a call to your local exterminator in Scottsdale. Here in Scottsdale we generally have the subterranean termite and the drywood termite Ecologically, termites are important for recycling nutrients, creating habitats, forming quality soil, and as a food source for predatory creatures. Termites are detritivores, which means that they eat debris and recycle decomposing materials as nutrients that enrich the soil. Termites that build nests near your home, however, are something else entirely. This is why we use a wide variety of methods, including the Sentricon termite elimination system. Which Costs More? Termite Control in Scottsdale, Or Repairing Termite Damage? Termites are widely regarded as pests because of the level of damage they can cause. In one notable case in India, they literally ate up $4,000. Because we like the same temperate climates, termites and humans often clash. Termites can cost billions in property damage. As if that weren’t bad enough, they are also major producers of methane, the second most dangerous greenhouse gas next to carbon dioxide. Should You Call For A Termite Control Inspection of Your Scottsdale Home Today?